The Cobra CPI 880 is a quality inverter that is capable of powering a wide range of devices and appliances. Use it in your automobile or RV, take it camping or tail gating along with 12V car or marine batteries and you can have AC power whenever and wherever you need it. Preppers can use this inverter with a portable solar panel/controller and scavenge car batteries as needed to have AC power for an extended time in a Doomsday scenario. The Cobra CPI 880 can power up to 800 watts continuously. Check the wattage on your devices, but typically devices such as the following can be powered from this inverter: small and some larger refrigerators and freezers, TVs, microwave ovens, coffee makers, pumps, radios, fans, several 150W halogen lamps, a 250W reversible drill, cordless drill chargers, computers, etc. This inverter can also keep your cell phone and hiking GPS charged. Another higher wattage Cobra model is also available as described below. If Doomsday ever occurs, preppers could use this inverter with a solar panel, controller and 12V DC car or marine batteries that they already have in their preparations or that they barter for or scavenge. This particular inverter is rated for 800 Watts continuous and 1600 Watts peak, and has built in protection to shut itself down if you do overload it. It has two AC outlets and one 5V USB Outlet. You can buy cheaper inverters rated at one half or less of the wattage, but you get what you pay for. Most of the cheaper inverters are rated at lower wattage (like 300 watts for example) so you are more limited on what you can power. And these cheaper inverters, although they have overload protection, they usually do not have external fuses as the last level of protection. Instead they have internal circuit boards and a fan. So they are more disposable. The Cobra model above has external fuses in addition to 5 levels of protection for thermal shutdown, reverse polarity protection, over-voltage shutdown, low voltage shutdown and low voltage alarm. It is also available in higher wattage capacities, as are other more quality and more expensive power inverters. For a higher price but still a great value, you can upgrade to the Cobra CPI 1575 rated for 1500 Watts continuous and 3000 Watts peak (link below). For example, the higher wattage model (link below) would allow you to power a 400 watt coffee pot and a 1000 watt microwave simultaneously. Note that both of these Cobra inverters produce modified sine wave power instead of the pure sine wave power produced by your power company. Pure sine wave inverters are available but cost significantly more. Pure sine wave inverters are needed for appliances requiring a precise frequency power supply (timer, measuring instruments, etc. ), Sine wave appliances, and appliances using phase control such as blankets, dimmers, etc. 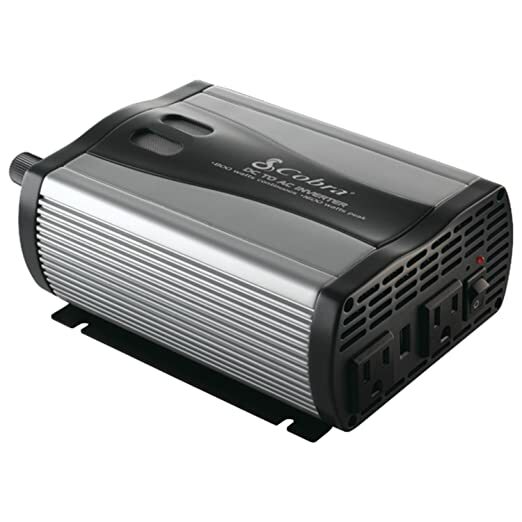 The following YouTube video is a review of the Cobra CPI 880 800 Watt Power Inverter. "Highly recommended!!!!!!! I bought this inverter October 25, 2011 and I must say that in the over 3 years I've had it, it has done me very well. I use it in my mobile lock shop (van) to run tool with. I am very pleased with it and would definitely buy this again. I highly recommend this item." "Great inverter. Had this for some time now never let me down it's got over load shut off and 1600 watt peak power so can power almost any thing I want and if I power so much stuff it shuts it's self off so I don't mess it up"
"Had this a long time use it every weekend works great." "Got this to put in my little RV. I was looking for something small enough to not draw down the one battery I have in the Coach. Installed under a cabinet close to the battery and ran 10 ga wire to it. Plug in the Coach electrical cord to it and turned it on. It will run a Radio or TV or the Microwave or the Fan in my A/C but not the A/C itself which would take about a 3000 watt inverter which would drain my battery really fast! I watched TV and listened to the radio for 2 days and finally ran the battery down running the A/C fan on the second day. It's a little workhorse. Good for the price too!" "Plenty of power. Am using it as a power supply off a Group 24 battery that is replenished by a Renogy 100W solar panel. The two AC outlets and USB ports provide the power I need for a CPAP machine and other devices." "Nice converter. Very nicely built and seems to do a good job converting from a Car charger b/u battery really well. I've also jump started my riding lawn mower several times and it seems to have plenty of reserve. I've used it to power a P.A. System and using a 200+ Crown Amp and Bose speakers, a mixer and keyboard which runs quietly and easily for over an hour, converting the power from a 800 watt b/u battery. The line seems clean and noise free using this converter." "Excellent inverter but read manual to understand what 800W means..... I have run a full load test that meets the expectation. Average power consumption tested is 700W (peak close to 800W -- which is not suggested by Cobra for run over a hour. Cobra says that inverter MUST take 15 minutes break when inverter works at 800W output for a hour, so be careful.) When power consumption (inverter output) reach 400W+, the cooling fan speeds up, and blow more noise. When starting both drills simultaneously, both lamps had slightly dimmer then back to normal; computer had no problem. It works as its specification and next thing is to wait to see its life span." Cobra Cpi1575 3000w Power Inverter With Digital Voltage Wattage Display & Usb (This one is rated at 1500 Watts continuous power and 3000 watts peak power) . Renogy 100 Watt 12 Volt Monocrystalline Portable Solar Suitcase (This lightweight suitcase comes equipped with two 50 Watts monocrystalline panels, a 10 Amp ViewStar Series Charge Controller with an LCD Screen for power regulation, a 10ft. tray cable with alligator clips for easy connection to your battery and a protective casing for safe portability). Duracell Powerpack Pro 1300 (If you want a PowerPack with a battery and built in inverter, the Powerpack Pro 1300 is a highly reliable, versatile and rugged portable power station that you can count on in any situation. If you buy one of these, as a prepper you would still want to have a quality standalone power inverter such as the Cobra CPI 880 to work with standalone 12V batteries). K40 K403CBPP 2-Wire 15A 3-Pin CB Power Cord with 12V Cigarette Lighter Plug (Note: This is a cigarette lighter adapter that you can modify to use with your inverter in your car. Note that most cheap cigarette lighter adapters are rated for 5A with 16awg or 18ga smaller wire and and some even do not have replaceable fuses. Just cut of the proprietary plug and attach this adapter to your inverter and you have an adapter with a 6' heavier 14awg wire with a 15A replaceable fuse. It has a green LED light that lets you know it is powering correctly). BESTEK® 12V~24Volt Car Cigarette Lighter Socket 12-Foot Extension Cord MRS301D (This 12' extension cord is fused at 30A. I would not recommend using lower amperage extension cords).